Last week I attended the PATH Intl 2014 Conference in San Diego! Never been to a conference before + husband did his undergrad in San Diego = a good reason to go. On top of that, I met a bunch of great people, have lots of notes for future blog posts, and missed the midwest’s first snow of the season. I think it worked out well! 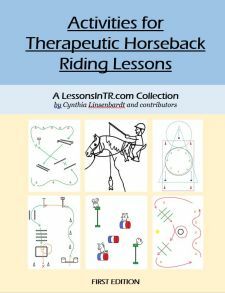 One of the bests seminars I attended was “Dynamic Collaboration: Maximizing Communication During Therapeutic Riding,” given by Karyn Lewis Searcy (an M.A. CCC-slp from Crimson Center) and Kaitlyn Siewert (from REINS), where I was reminded of the importance of silence and waiting. While as an instructor-in-training you are encouraged to speak all the time to your students, partly to give them valuable feedback and partly to one day show the evaluators all you know, there are many times silence is appropriate and needed, especially for language processing delays. Use a short statement with verbal inflection, wait (count to 5 or 10), then prompt as needed. Riders with expressive language difficulties need time to formulate a response and motor plan how to say it. Riders with receptive language difficulties need time to interpret what they hear on top of that! Speaking at them can compete/interrupt while they are trying to think. Inflections helps get the message across and can help them focus. Statements are easier to decode than questions. Short sentences with less words are easier to understand and imitate. Counting in your head forces you to wait. Sometimes silence helps riders refocus. Waiting helps the team focus on the skill rather than rushing to complete the task at hand. Also, it’s important to make sure the whole team knows to wait! Often well meaning volunteers jump in too soon. It’s helpful to set the standard right at the beginning of the lesson so everyone’s on the same page, regarding how long to wait before helping, and exactly what order of prompts to use and when and by who. 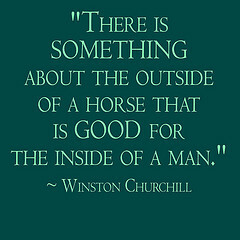 For example, I used this simple technique today with one of my riders who has speech delays and problems focusing. The past lessons have devolved into (name changed) “James, whoa your horse! James! James! Look at me James! Whoa your horse! James! James!” And this is not just me speaking but the sidewalkers too, who are also fumbling trying to help him out physically. Part of this is due to his parent’s precedent, but most of it due to me trying to force his focus and not clarifying anything with the sidewalkers. So today I established at the beginning of the lesson that we were working on “walk on” using our voice and feet, that when I verbally prompted we would wait 5 seconds and if nothing happened I would count “1, 2, 3, kick” and the sidewalkers would hand over foot help his tap the horse; and that for “whoa” using his voice and reins I would verbally prompt him to stop his horse, we would all wait 5 seconds, if nothing happened by 3 tap his hands, if nothing by 5 then hand over hand help bring his hands back and say “whoa” so the leader knew to stop. We also agreed that if he didn’t stop his horse on time by the barrel to keep walking until he did the skill, instead of rushing to finish the task. It worked beautifully. When we came near the barrel of rings I’d say, “Okay James, Whoa your horse.” Wait 3, sidewalkers hand tap, wait 2, sidewalkers hand over hand. We would end up way past the barrel. “James, can you reach the ring?” Wait 5 as he tries to reach it to no avail. “No? What should we do?” Wait 5, he doesn’t know. “Let’s circle and try again! Let’s walk on!” He says walk on but does not use his feet, so wait 5 seconds, say “1, 2, 3, kick!” and sidewalkers help him tap his horse and his horse walks on to try again. It worked very well in that the whole lesson ran smoother and by the end he was focusing better and using his feet more. It was interesting was that being quiet also helped him focus – aka ignoring him helped him realize no one was paying attention to his distractions (“Mom! Mom! Gate! Gate! Mom!”) and he started to return to the task quicker than when we used to bombard him with 3 people telling him to focus. His mom even noticed this and said she knows she needs to work on waiting for him to focus himself and do it himself as well! If you want some video examples, you can download their powerpoint presentation here on the Crimson Center website. Two videos are tucked in there near the beginning. From my experience therapists, especially speech therapists, really seem to have this waiting thing down. If you ever have the opportunity to shadow one using hippotherapy I highly recommend it! Fantastic! We wait. Sidewalks assist only after waiting. Independence seems to fluorosis when they can process a task with several components involved! I wish I could have been at conference! Thanks for sharing. I sadly missed this years conference due to a conflict. PATH conferences are invaluable in many ways. This is a wonderful post. Waiting is so important for our sudents. They must process what the direction is then motor plan to execute. During volunteer training sessions I always emphasize waiting before they do something. I try to make volunteers aware that doing everything perfectly timed is not always the best. I also tell them to let the rider make mistakes (as long as it’s not a safety issue) they will learn so much better. Working in a special education classroom for 15 years also taught me that even though the student is not looking at you or seems to be ignoring you they might still be listening and learning. There might be too much sensory overload or anxiety with looking someone in eye. Next time you are working on a task try to be aware of yourself looking away to concentrate or figure something out. Thanks so much for sharing this terrific insight, Chris! Hopefully I’ll meet you at another conference someday!